The Embudu Village ethos is to maintain an easy laidback atmosphere that welcomes in guests to make the island their home. 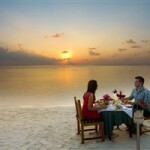 The resort is in the South Malé Atoll surrounded by turquoise waters. All the staff at Embudu Village go out the way to make guests feel at ease and comfortable. The easy-going nature of the resort allows you to relax, take in the scenery and explore the island. The resort is very conscious of environmental impact and therefore has implemented many innovative ways to reduce this. Your morning shower is heated by solar panels, your breakfast fruit is grown on a nearby island, and the fish at dinner is caught responsibly by local fishermen. The house reef is also gently cared for and maintained to ensure that guests can continue to enjoy the natural beauty without disturbing the marine inhabitants. 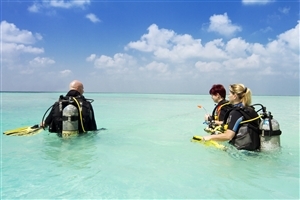 Only a short boat ride away from some of the best diving site in the Maldives the diving centre offers courses for beginners and advanced divers. On diving boat trips, you can spot sharks, manta rays, turtles and more. For a more relaxing day head over to the island’s resident spa Serene which offers indulgent beauty and wellness treatment for mind, body and soul rejuvenation. However, for a day full of adventure take one of Embudu Village’s tailored excursions where you can snorkel, visit local islands or enjoy some authentic fishing. The villas at Embudu Village are either nestled amongst the palm trees of the beach or perched above the lagoon waters. 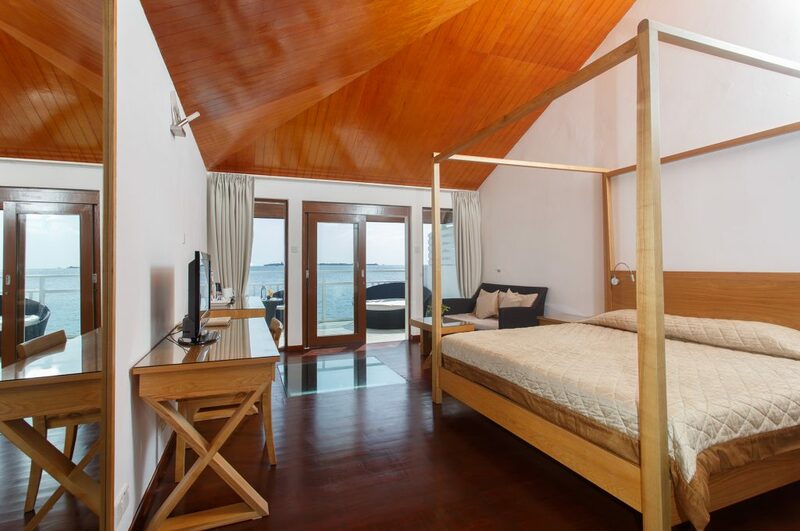 All the villas in the island have four-poster beds to sink into and are filled with thoughtful modern comforts. 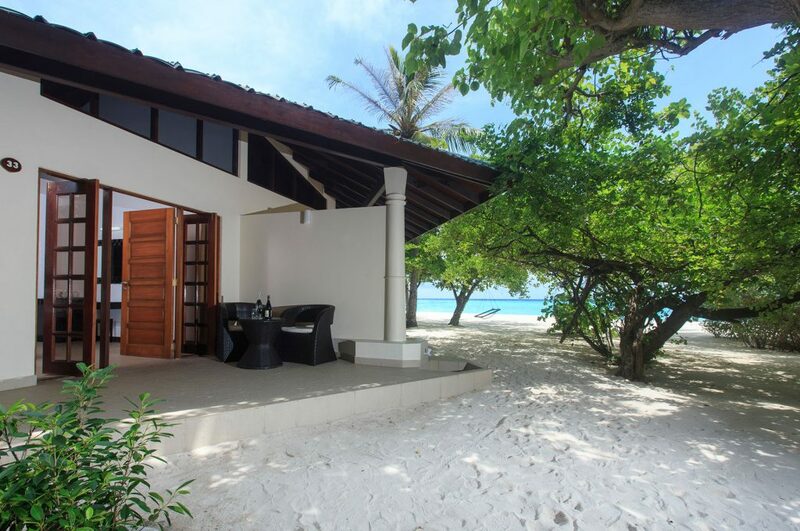 The beach villas are airy and bright with rustic timber flourishes and classic whitewashed walls and are perfectly situated for taking a morning stroll along the sandy beach. 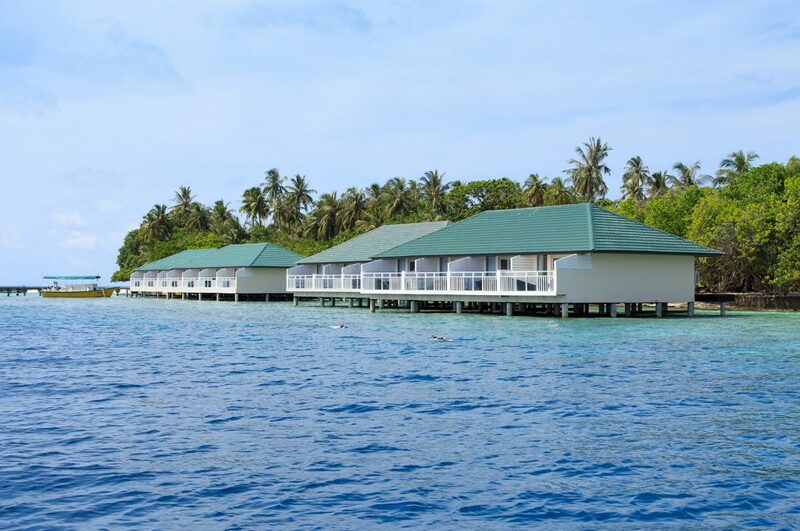 The water villas are indulgently comfortable and even feature a glass pane in the floor where you can view the shoals of vibrant tropical fish swimming by. Your breakfast lunch and dinner at Embudu Village is served at their all-day buffet style restaurant. 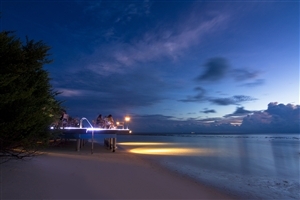 The dining theme changes each night with a focus on sourcing local fresh ingredients to be prepared by award-winning chefs to provide guests with a laid-back flavourful experience that pays homage to the Maldivian experience. There are also à la carte options for special celebrations like fresh lobster. The island bar serves refreshments throughout the day and cocktails to watch the sunset with. The Superior Rooms offer excellent value for money. This accommodation has an airy feel to it and includes a large bed. 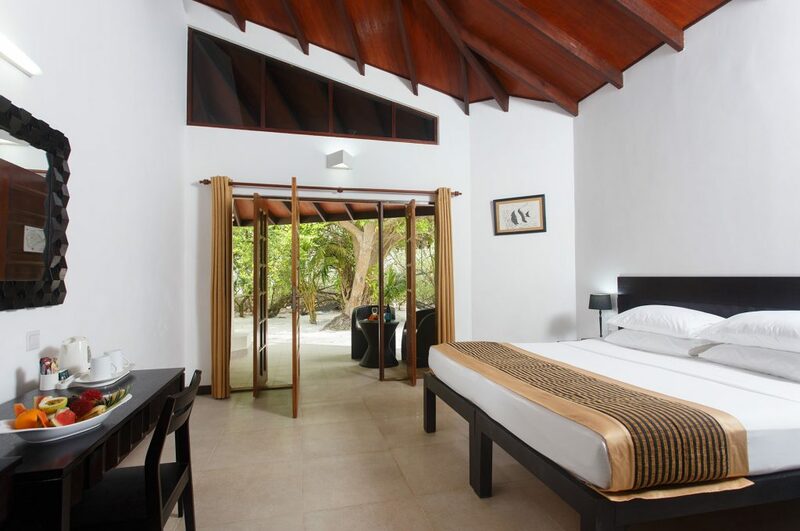 Your Maldives holiday spent in the Superior Room at Embudu Village will be one to remember. For a more exclusive Maldives experience, choose the Water Bungalow. It boasts an incredible location directly above the turquoise ocean, so you can let the magic ocean breeze soothe you to sleep in the night. The Water Bungalow is ideal for unforgettable honeymoons in paradise. 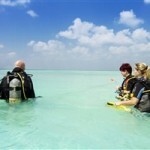 If you travel to Maldives to discover fascinating marine life beneath the surface, then you have come to the right place. Embudu Village offers both snorkelling and scuba diving, including diving excursions to nearby coral reefs. In addition, the resort also offers Wi-Fi in the lobby area (at a charge) and there is a small shop. Sport activities include volleyball, badminton, table tennis and darts, so there will not be one dull moment spent on this pristine island. 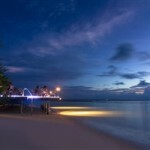 Night fishing and shopping excursions to Male are also offered, as well as weekly DJ nights / magic shows. Those wishing to truly pamper themselves can do so in the lovely Serena Spa. Why not try the ‘Island Indulge’ package or maybe the ‘Soothing Hot Stone’ massage? There is a lovely main restaurant which is open all day long. 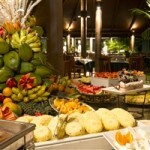 Here you will indulge in lavish breakfast/lunch/dinner buffets, consisting of exciting local and international cuisine. 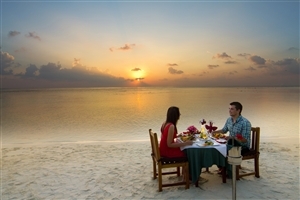 Simply Maldives Holidays offer Full Board and All-Inclusive packages to guests staying at Embudu Village. Breakfast, lunch and dinner are served at the resort’s restaurant in a buffet style with changing theme nights and live cooking stations. 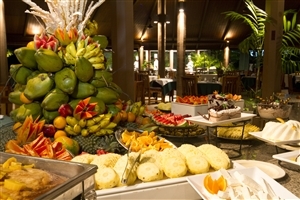 Breakfast, lunch and dinner are served at the resort’s restaurant in a buffet style with changing theme nights and live cooking stations, as well as unlimited tea, coffee, water as well as selected soft drinks, and alcoholic beverages. Fruit basket, a small bottle of wine and bed decoration once during the stay.